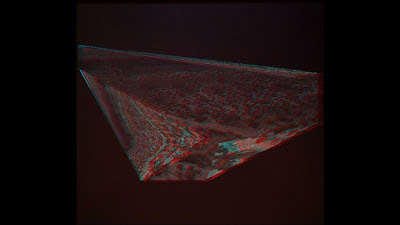 It is of interest to compare Blake Williams’ experimental short film Many a Swan to two other impressive stereoscopic films, John Carter and Prometheus. In John Carter the 3D adds depth to the mise en scène by projecting its background further into space and in Prometheus the technology accomplishes something that the old science fiction films wished that they could do - pop out of the screen. Williams, who is inspired by the origami master Akira Yoshizawa, uses technology to extend Deleuze's concept of the fold. The concept comes from Deleuze's discussion of the Baroque and maniérisme, with their focus on altering, twisting and folding visions of reality. Many a Swan consist of found footage (most likely from YouTube) and contains many folds; the superimposition of images, the contrasting of live-action and CGI rendering, the distortion of video planes. Many a Swan, like Coorow-Lapham Road before it, is also a journey of perception as in each frame and scene there are many-fold areas of movement and stasis that draws one’s attention. Like so much of Williams’ other work that incorporates technology and its limitations, so is Many a Swan about medium-specificity as it reminds us what it consists of with the blank shots of the two primary colors of 3D technology that of blue and red with their many shade gradations. Many a Swan is Williams’ 9th official directing credit and it is both a continuation of his thematic interest and a radical shift in tone from his other work. But this reinvention of form is a given for Williams whose films are totally different from one another but whose interest remains constant, which is that of physically and digitally creating images and the devices used to capture and distort them. The film that Many a Swan is most like in Williams’ body of work is Depart. Just like how Depart is a transition film from his landscape films (The Storm) and his student experiments (No Signal) in it Williams’ starts to include digital alterations to the footage instead of only physically altering them. In Many a Swan there is a shift away from the linearity of Coorow as its images are broken up by editing and folding. Who knows what Williams is going to create next (the abandoned 3D remake of Michael Snow’s Wavelengths sounded fascinating) but it is surely towards the limits of representational arts. For this reason, out of all of the Toronto DIY filmmakers, Williams is the heir of the Escarpment School for his preoccupation with reinventing the painterly Canadian landscape tradition. I will be moderating the question and answer period for Kazik Radwanski's Tower (MDFF) tonight on Sunday February 24th at the 7PM screening at The Royal. - D.D. An exhibition which addresses digital space as procedural landscapes. Rather than creating games where prescribed routes and narratives directing player movement and action, the works of Other Worlds position the player as a digital flaneur; free to move anywhere within these worlds, while occupying the position of a detached observer. Other Worlds features the Canadian exhibition debut of The Night Journey, created by Bill Viola and Tracy Fullerton in additition to works by Luis Hernandez, Alex Myers & Jeff Thompson, Lea Albaugh, Arcane Kids, Ed Key & David Kanaga, Alan Kwan, Cyril Lecomte-Languérand, and Axel Shokk. 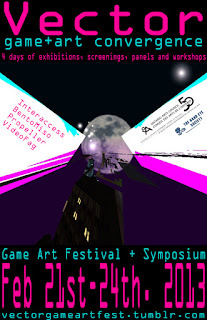 An experimental workshop/exhibition project which takes 3 young game designers and asks them to transform their games into new media art installations. Ludacy festures work by Damian Sommer, Alex Martin (Droqen) and Cale Bradbury (Net Grind). This exhibition surveys the myriad of practices that fall under the umbrella of game art creative production. Video, photography, art games, textile and more. net.works features works by Kenton Sheely, notendo, anna anthropy, Christian Streinz, Aaron Oldenbury, Jose Acosta, Jason Nelson, Myfanwy Ashmore, Gavin Bailey, Tom Corby & Jonathan Mackenzie, Hannah Epstein, Alex Myers and coll.eo. Stranger Comes to Town: Identity and the Avatar. Exploring the politics of the avatar in relationship to identity by examining massively multiplayer online role-playing games (MMORPG), technologies of biometrics and the border that separates our real identity with our digital selves. Featuring films and videos by Peggy Ahwesh, Zach Blas, Valerie Brewer, Jacqueline Goss and Toronto artist Sandra Danilovic. What do a classic video game cabinet, a tv, and a snack dispenser have in common? How are they different? This program reflects on the nature of the medium. Featuring films and videos by Stephanie Barber, Eddo Stern, Scott Stark, Beflix, Gun Holmström, Meesoo Lee, IP Yuk-Yiu. Playing Personae: Engendered + Embodied Performances. 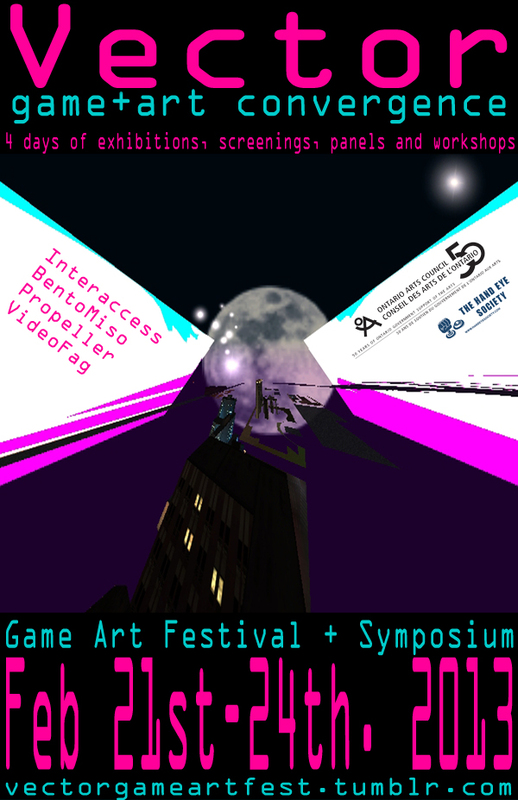 Using games as the focal point for discussions of gender and embodiment, these performances address the representations of gender in gaming culture and technologies. Featuring performances by Angela Washko and Toronto artists Daniele Hopkins + Kyle Duffield. A special screening of animation, commercials and other ephemera from the history of game culture’s intersection with broadcast television. We invite you to bring your children and your inner-child to spend Saturday morning eating sugar cereals and watching classic cartoons inspired by your favourite video games. Now this is not the end. It is not even the beginning of the end. But it is, perhaps, the end of the beginning. Exploring the competitive nature of video games and the desire for simulated violence. Featuring films and videos by Craig Baldwin, s.ara, Paul Atkins & Ian Campbell, Kathleen Daniel, Wei– Ming Ho, Josh Bricker and Jon Rafman. Game engines as tools for live performance. Toronto based artists Toca Loca will be performing their Halo Ballet (a live choreographed ballet performance in Halo, featuring a live musical score). Foci+Loci creates live electro-acoustic sound pieces using custom game levels built in Sony’s LittleBigPlanet. Closing Festival Party and Screening: Bonus Level 2: f@n f_uckery! Weird and wonderful experimentation and creative interventions made by fans. This night promises to be strange. Featuring films and videos by Bryan Peterson, Mat Lindenberg Tomasz Wlaźlak, David Musgrave, and Toronto artists, Jim Munroe, Mark Pellegrino, Edward Shallow and Sean Grounds. In anticipation for the class The Coen Brothers in Nayman's Terms, an eight-week series at the Miles Nadal JCC on the Mondays at 7PM (see the Facebook page for more info), I chatted with Adam at the Ideal Coffee on Ossington to talk about the class, the Coen brothers, and Toronto-based independent cinema among other things. - D.D. David: Before we start: are you coming out to the MDFF short-film program tonight? I also wonder what are your thoughts on these emerging young independent filmmakers here in Toronto? Adam: I don't think that I'll be able to make it, unfortunately. And regarding local filmmaking: yeah, I like them. There seems to be some pretty interesting filmmakers. There is Calvin Thomas and Yonah Lewis who are still waiting for their new movie The Oxbow Cure to premiere and there is Igor Drljača and his film Krivina, Simon Ennis and Lunarcy!, and Dan and Kaz with Tower (who are accompanying it with local short-films when it opens on Friday at The Royal). So I think that it is a good moment in the city. I also think that with Ingrid Veninger's $1,000 feature film challenge they created some pretty interesting movies like Nadia Litz's Hotel Congress. It’s a happy coincidence of timing. I do feel like something is going on because not only are these films being made and not only are they good but they are also getting released. And the person who I think should get some kind of mention here is Stacey Donen for his programming at The Royal and his work with College Street Pictures that distributed Krivina and Tower. So I think that Stacey is putting his theater where his mouth is in terms of nurturing independent feature filmmaking. And I think by the time you post this Jason Anderson is going to have a piece on the same subject in The Grid. David: I've been attending the classes since the beginning with the classes on World Cinema and Controversial Directors. I like them for bringing together cinephiles in a social setting to hear someone talk about movies seriously. What are your thoughts on how the classes have grown? Adam: Well I'm happy about it and so is my boss Esther. It's something that we've been working on. It is great when people in the film community help too. In the Media Mondays series Kevin Courrier also gave a couple of classes. They are easy to prepare because the technology is there to create DVDs with clips from the movies. Let's call it do-it-yourself film studies. If the classes got bigger and more successful it is because, I would like to think, that I’m good at it and that I know what I’m doing. There is a lot of loyalty and generosity among the people who come, too. Because I must say the class does ask something from somebody: you come for two hours and you're paying money and you're not seeing a full film and you might not know too many people who are there. So I realize if that it is not a hard sell, it is still not the easiest sell in the world. And I’ve tried to pick films and filmmakers that would be popular and grow the course. If you pick Stanley Kubrick you're making a pretty good bet that people would be interested in the course. If you pick the Coen brothers, well, we will see. David: Why the Coen brothers? And why now? Adam: Good question. I think that after the Kubrick class I was wondering what director to talk about for the next one. I asked myself who is accomplished and famous enough to get a big enough of an audience. Though the JCC never insist that I choose a Jewish filmmakers or Jewish artist it is like the joke about the ad in the Jewish paper for rye bread - it wouldn’t hurt. By coincidence I also had recently seen Raising Arizona and Blood Simple and I realized how much there is to say about their old films. So my first thought was that there used to be so much to say about the Coen brothers and that now, but for the odd exception, there isn’t. Then when I watched the newer films again I realized that the opposite is true and that I was finding much more of interest, of auteurist interest, in the newer films. So I thought that if the older films are being revisited by the people my age and they are still of interest and that maybe the newer films are better than we thought, and if sprinkled over the last 30 years they've made some undeniable classics like Blood Simple, Fargo, Big Lebowski, and No Country for Old Men, than this is enough material for a pretty good class. When you ask why now that is another good question because it is not like they are retiring or one of them has died, and their new film Inside Llewyn Davis isn't coming out until later on in the year. So to answer the question I want to say that filmmakers like them are just perennially interesting. It is not like Stanley Kubrick wasn’t any more dead last year than the year before or the next. So I guess when you are dealing with the canon or the pantheon of filmmakers then any time is a good time to talk about them. I guess what I’m less confident is if the Coen brothers belong there is in the canon. Sometimes I think they do, other times I’m not so sure. David: How is the class structured? Adam: There are eight classes that are spread across ten weeks. The lessons are not strictly chronological as I’m trying to give a sense of the arch of their career. For example in the first class the focus is on Blood Simple and Raising Arizona because I want to give a sense of where they came from. In the following classes they are divided more thematically. For example in the second class the focus is on the film noir genre and how they appropriate it in Milller’s Crossing and how it interacts with it and the same for The Man Who Wasn’t There. Following that there is going to be a class on screwball comedy and in particular The Hudsucker Proxy and Intolerable Cruelty. From there onwards I try to pair things in a way that I find to be interesting like The Ladykillers and True Grit as part of the remakes class and so on. The only film that I’m giving a whole class about is A Serious Man, which is a film that I in particularly really like. David: When people talk about their films some criticism that are brought up include their reliance on pastiche, irony, and formalism. What is your perspective on this aspect of their films? Adam: Pastiche is right because they are obviously pastiche filmmakers. Whether that is negative or not is a matter of taste. Because they are truly postmodernist in that everything that they do comes out of or is derived from pre-existing text, whether they are filmic or literary. What I think is remarkable about them is that everything that they make is a synthesis of allusions and references but what they end up making is a genre into itself that of the Coen brothers film. So when they make a screwball comedy they aren’t lost within it but instead they make it into a Coen brothers film. Some people find this to be too assertive or presumptuous and others say that is why they are auteurs. You can say that they are formalist or you can say that they are commercial mainstream filmmakers who just pay attention to form and are gifted at finding the right form for their films. I think that the idea that all of their films are all stylistically similar is simplistic. So many of their films have different tones and style. Movies like Raising Arizona and The Man Who Wasn’t There are really different in terms of their look. On the other hand these two films are similar in that they are both about men who just want to find a sense of normalcy. Another major criticism of their films is that they are cold and cruel and mean-spirited. 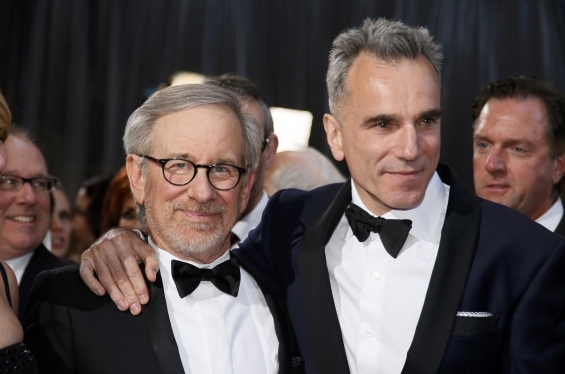 The question is to what extent does that detract from their films? We like to think that artists are entitled to a temperament and theirs seems to be more cynical and bleak. I try not to hold this temperament against them. Ironically it is one of their most acclaimed films but I find No Country For Old Men to be the least persuasive for its nihilism. Because in that film I think there is a big disconnect between how much Cormac McCarthy means it in the book and how much they do in the film. 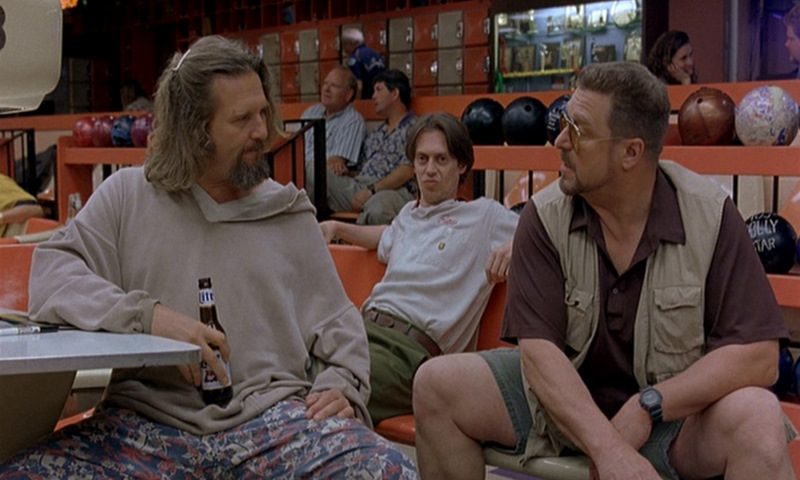 David: What are your thoughts on the literature about the Coen brothers? Adam: I find the new Ian Nathan book in the Masters of Cinema series to be skimpy but I don’t hold it against him because it’s a setback of the picture-based format of the series. The R. Barton Palmer book in the Contemporary Film Directors series on the other hand is good but because the book is from 2004 it doesn’t touch upon their more recent work. I think that Palmer is really good at some things like connecting The Hudsucker Proxy to the films of Frank Capra or elaborating on how Fargo is able to change the everyday into the exotic. Unfortunately I think that he underrates some of their other films like The Big Lebowski and Raising Arizona. But what I think is perhaps one of the best piece on the Coen brothers is a little essay by Kent Jones which he wrote on O Brother, Where Art Thou? where he discusses many of their contradictions: their freshness and their predictability; their singularity and their derivativeness, and so on. David: Thanks for doing this, Adam. And I look forward to attending some of the classes once they begin on Monday, February 25th. Any last words? Adam: The hope is that people would come out and that they would learn new things and that they are getting a good analysis. But I also want there to be a discussion. Because the Coen brothers are such polarizing filmmakers I would like to hear more about what other people have to say about them, even if that means being contradicted. I would like more people to contribute this time around. I hope that if anyone is reading this, and if they’ve never been to the class, then if they come then they would ask questions, make comments, and argue for their favorite Coen brother’s films. Because I think that is what is fun. It is exciting when people who care about cinema talk about it and debate about it in a mature way. I hope this class gives people a framework for that. To accompany the Oakville Galleries’ exhibition Where I Lived, and What I Lived For, Jon Davies is programming for Early Monthly Segments Andy Warhol’s Kitchen (1965). The screening will be Monday February 18th at 8pm at the EMS regular screening venue, the Ballroom in the Gladstone Hotel. "A unique and often overlooked confluence in Canadian film history, the "Escarpment School" denotes a loosely knit band of Ontario-based experimental filmmakers — including Philip Hoffman, Mike Hoolboom, Richard Kerr, Carl Brown, Gary Popovich and Steve Sanguedolce — who studied together at Sheridan College in the 1970s, under the tutelage of Rick Hancox and Jeffrey Paull. Influenced by both the New American Cinema and its conterminous postwar movements (especially Beat literature) as well as the Canadian social documentary tradition (which were often screened side by side in the Sheridan classroom), the Escarpment School cineastes have over the course of thirty years helped to reinvent documentary as a mode for self-expression and formal exploration, extended and deepened the rich landscape tradition in Canadian art, and inspired new generations of filmmakers through their work and their teaching. Although varied in tone and texture, the films in this program share numerous qualities, including an attention to landscape, the filtering of documentary material through individual experience, the looming presence of America, and a formalist, process-based approach to non-fiction."